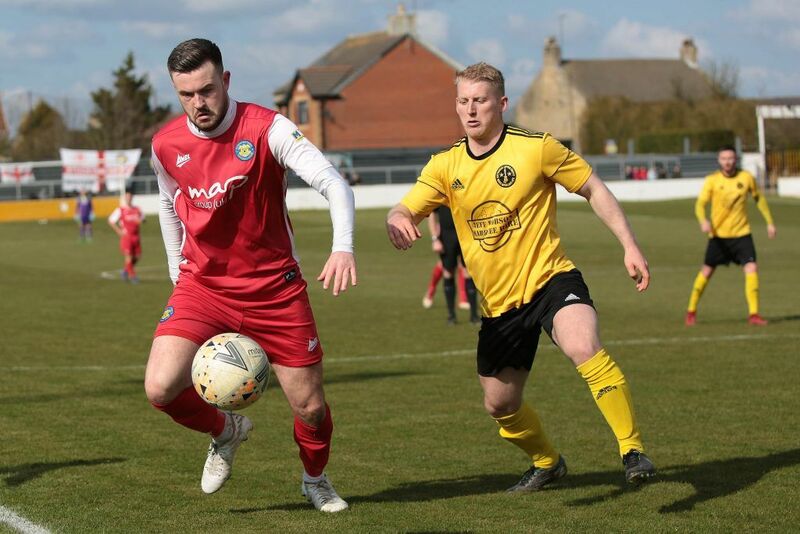 Stockton Town signed off their season their season with a draw as Sonni Coleman’s second half strike earned them a share of the spoils against West Auckland at the Wanted Stadium. 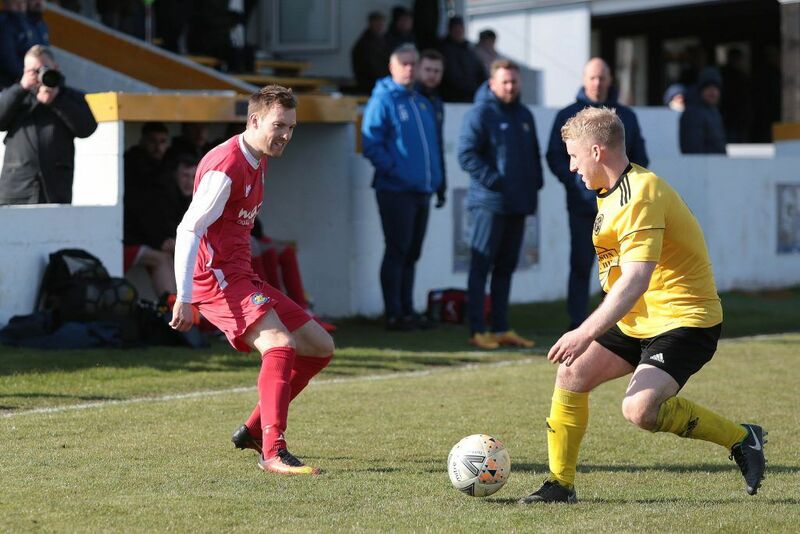 Heading into the game on the back of three consecutive defeats, Michael Dunwell’s side were keen to bring the curtain down with a positive display. They did just that by earning a highly respectable point against a side brimming with players with experience of higher leagues. Peter Bulmer on the attack for Stockton. 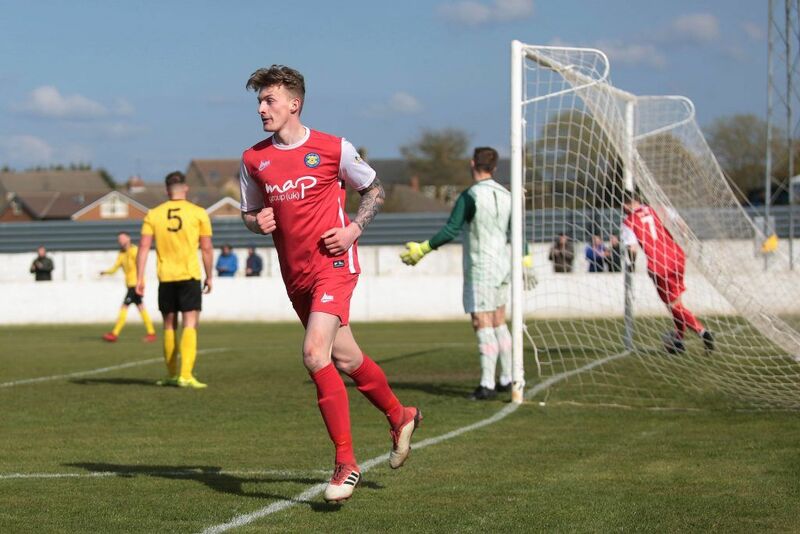 Stockton were out for revenge from West’s League Cup semi-final triumph at the Coverall Stadium just a couple of weeks prior and set up with many attacking options with Mikey Roberts, Sonni Coleman, Fred Woodhouse and Chris Stockton all in the starting lineup. 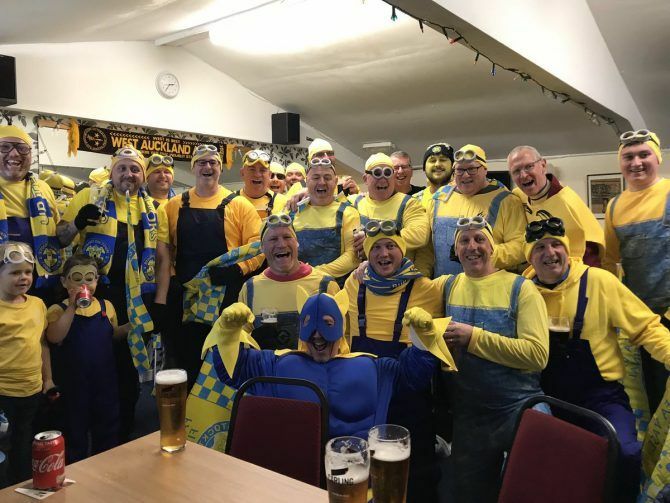 The Anchors started brightly having been serenaded onto the Wanted Stadium turf by an army of travelling Stockton fans dressed as minions, who were in fine voice throughout. They could have led as early as the seventh minute when Max Craggs seized possession and drove towards the home area. Play opened up for the midfielder and he chanced his luck but the ball bobbled on the uneven surface and he skewed his effort wide. It wouldn’t be the last time the surface would cause problems for the two sides. Stockton’s best chance of the half came on 26 minutes and they really should have hit the front. Roberts, playing from wide on the right rather than his usual central striking role, sent over a teasing cross that found Fred Woodhouse unmarked at the back post. He sent his header into the ground but then wide of Shane Bland’s goal when he perhaps should have sent the travelling minions into celebrations. Woodhouse was proving to be difficult to get a handle on and just after the half hour mark, he released Stockton behind the defence down the left. The winger pulled the ball back across goal where Bland recovered from losing his footing to deny Jordan Robinson before Woodhouse sent the rebound cannoning off Coleman and wide of the mark. West Auckland threatened to hit the front in spectacular style five minutes before the interval through a stunning strike from midfielder Louis Dodds. Stockton believed they had cleared their lines from a corner but the ball dropped out of the sky to Dodds standing 25 yards from goal. He volleyed first time and with Michael Arthur a spectator between the posts, his effort scraped the outside of the woodwork. Sonni Coleman was on target again for Stockton. The deadlock was finally broken ten minutes after the restart and it came from a clinical Anchors counter attack. Having created an overload down the left, Stockton released full back Jimmy Ward. He sent a telling low cross across the face of goal and Coleman was on hand to tap in the game’s opening goal. The goal seemed to galvanise the home side and they would assume the ascendancy. They could have been level on 64 minutes and would have been had it not been for an excellent save from Arthur denying substitute Nathan Fisher at close range. If this was a warning, Stockton didn’t heed it. The equaliser would come from the same source just three minutes later. The ball was played into Fisher on the West Auckland right and his turn left Ward for dead before he advanced on goal. 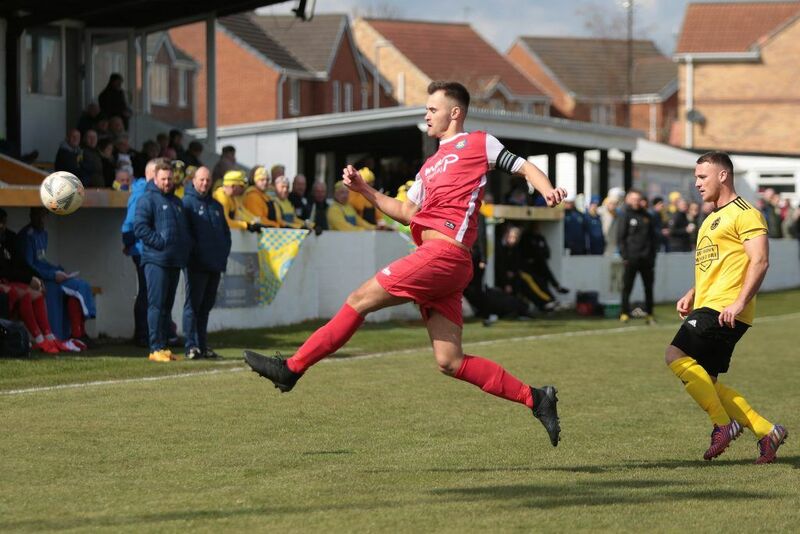 The former Darlington and Gateshead forward struck an effort from range that deceived Arthur and brought his side back on terms. Adam Nicholson and Tom Coulthard were again a resolute presence at the back for Stockton. A frantic finish would ensue as both sides pushed for a winner. Stockton would go close when Ward found Craggs in the area. His effort was brilliantly saved by the legs of Bland before the second ball fell to substitute Kevin Hayes. His shout looked destined for the net but a selfless block from Tom Price somehow kept West Auckland level. The home side were not without their own chances to win it and went close on 77 minutes. Fisher again was proving to be the thorn in the Stockton side and it was another effort from range. This time he beat Arthur but was denied by the woodwork. As the referee brought an end to proceedings he also called time on Stockton’s season. Michael Dunwell’s side finish the campaign in seventh pace and as the division’s joint top goalscorers. West Auckland: Bland; Mitchell (Fisher 46’), Hunter, Colquhoun, Cobain; Francis, Dodds, Portas, Price; Snaith, Purewal (c). Subs not used: Connor, Bell, Coulson. Stockton Town: Arthur; Bulmer, Coulthard, Nicholson (c), Ward; Roberts (Hayes 68’), Robinson, Craggs, Stockton; Woodhouse, Coleman. Subs not used: Cossavella, Taylor, Mohammed.